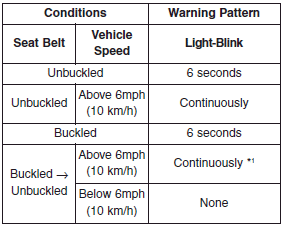 The front passenger's seat belt warning light will activate to the following table when the ignition switch is in "ON" position. *1 The seat belt warning light will go off if the vehicle speed decreases below 3 mph (5 km/h). If the vehicle speed increases above 3 mph (5 km/h), the warning light will blink again. 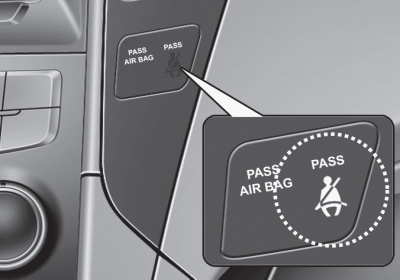 You can find the front passenger's seat belt warning light on the center fascia panel. 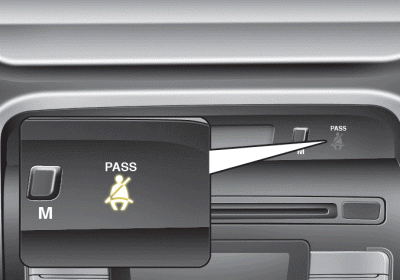 Although the front passenger seat is not occupied, the seat belt warning light will blink for 6 seconds. The seat belt warning light can blink when a briefcase or purse is placed on the front passenger seat.